Below is a look at the Pietenpol project of the CC#32 local hosts Kevin Purtee and Shelley Tumino. It is about 85% done. 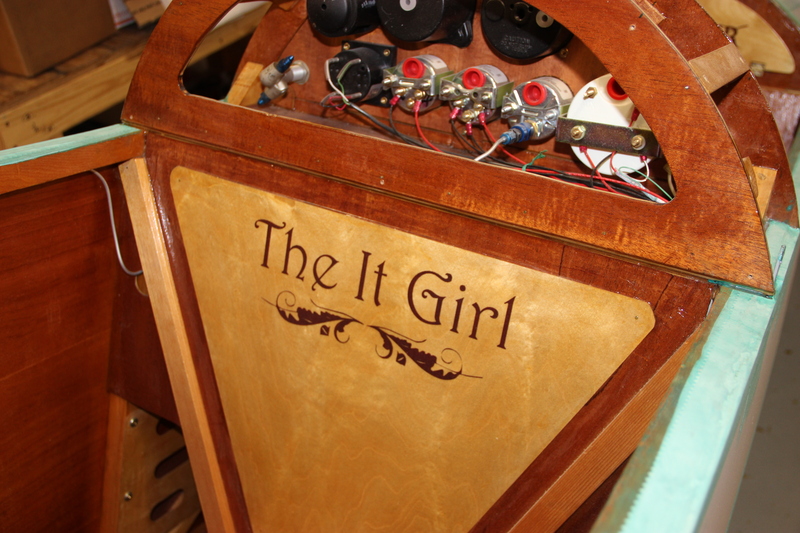 It is an extensive update on their old Piet. 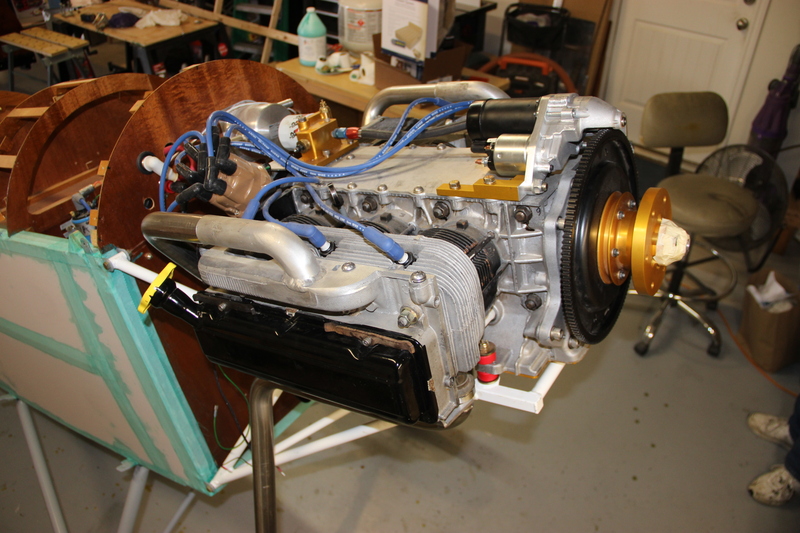 The photos offer a good look at what the most current Corvair installation on a Piet looks like. In the descriptions, I am going to demonstrate how the modern part numbering system we use in our manuals, Web sites and communications makes describing and understanding the engine and its installation much more accurate and allows builders to visualize their own installation. 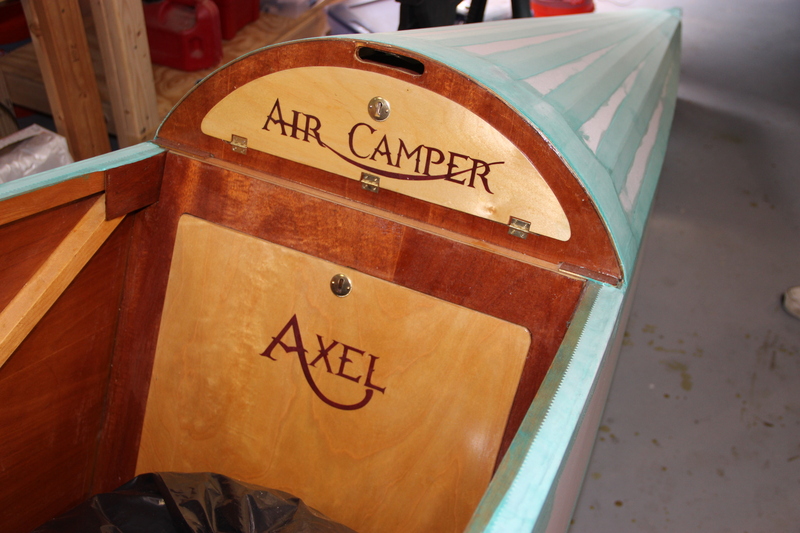 The numbering system is universal: It applies to all Corvair powered planes, not just Pietenpols. You can get a general overview here: Group Sources for the new numbering system. Above, the other side of the engine. Visible at the top is the starter. Everything on starters is Group 2400. 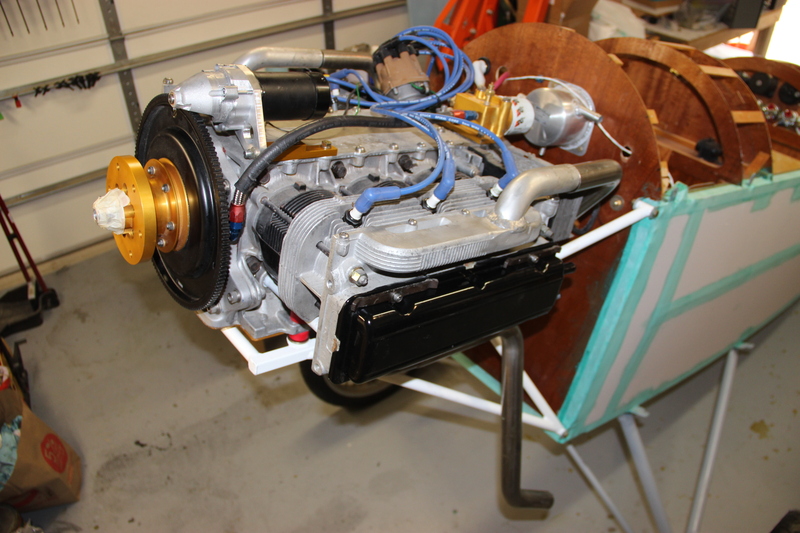 Kevin’s engine is equipped with one of our new ultra light weight systems: 2400-L Starter . This system is a complete group, and ordering one off our products page covers everything in Group 2400, including the ring gear #2408, the mounting brackets #2402-L , the top cover #2405, the gasket #2406 and the hardware #2407. Kevin’s plane has one of our Electronic / Points ignition systems, #3301- E/P. The ignition systems are in Group 3300. Above, shows the Stainless Pietenpol exhaust we make. Exhaust systems are Group 3900. We have sold a number of 3901-C exhausts to Piet builders with standard motor mounts, but our high thrust line mount does not fit that exhaust because the mount is 3″ longer than the one that was in the Pietenpol plans. Thus we have developed a new part number 3901-E, just for Pietenpols with our #4201-C motor mount. Oil pans and installation parts are Group 2200. The Gold billet oil pan pictured is #2201-B. The new manual covers every detail of the engine, not just the parts we sell. For example, the motor mount bushings are #4203 and the mounting bolts are #4204. The book explains what they are and where to buy them directly. These parts have a #42xx number, because they are in the chapter with motor mounts. Above, Kevin’s simple panel. Do not mistake his panel for an indicator of his skill set with aircraft. He has spent 25 years as a combat Helicopter pilot, he holds an ATP, and has several hundred hours in Pietenpols. Often, the most experienced pilots make the most appropriate choices when it comes to instrumentation in particular planes. Almost without fail, when a guy tells me he is going to put “Full IFR” instruments in a plane like a KR-2 or a 601, It means he has 0.0 hours flying on instruments in light aircraft. I do not blame these builders for such choices. 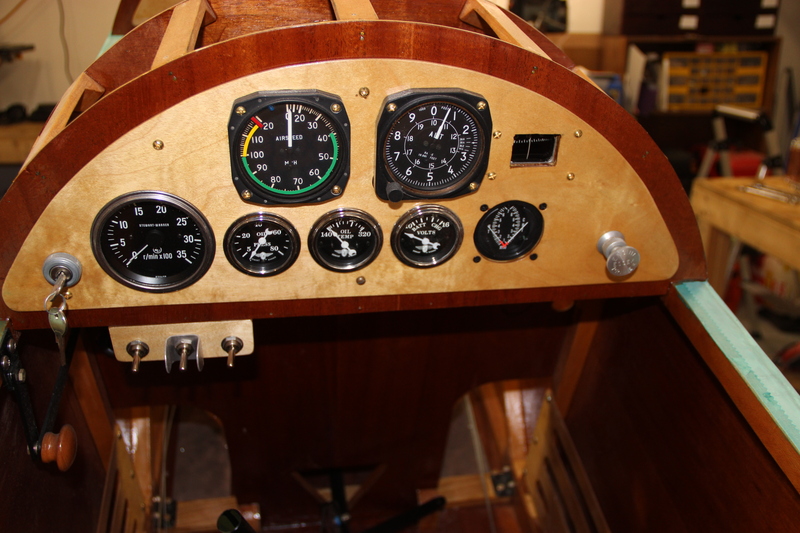 Homebuilders have been bombarded with countless stories and thinly veiled marketing campaigns promoting excessive instrumentation in homebuilt planes for the last 25 years. Put what ever you like in your own plane, I am only suggesting an honest and careful evaluation of what will serve you, in place of just going with what is in magazines or is being promoted by dealers. Above, the pilots seat. Kevin’s planes was one of the 30 Pietenpols that I weighed for the Weight and Balance project. ( Pietenpol Weight and Balance project ) Many of the planes we measured that had Continental A-65 engines had chronic aft CG issues, partial because that engine is lighter than a Corvair or a Ford Model A, but mostly because few Piet builders took the time to read the plans carefully, including the Weight and balance sheet provided by the Pietenpol family. Kevin planned better, and his plane could take a 300 pound pilot without going out of the aft CG limit. 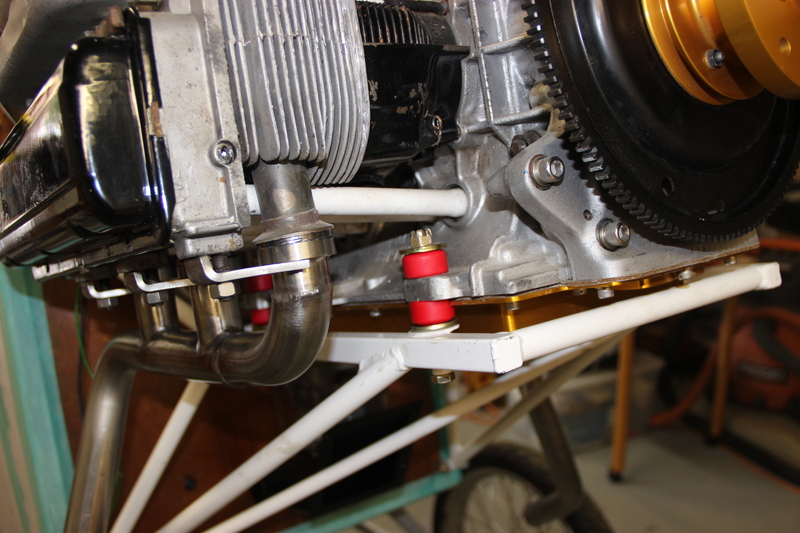 Does the photo of the motor mounts show both the upper and lower washer installed on the bushings? I used both to start with, but later removed the lower washer because I thought I saw that advice in one of your post. Is this important? Could not find in old or new manual, but could have easily overlooked. That is good observation skills, but in this case it is not a critical issue, and I have flown them both ways. If a builder welded his own mount and the pads were not smooth or flat, the lower washer would help provide a smooth surface for the red bushing to rest on. If it is one of our mounts, you can run the bushing directly on it, saving the weight of the washers. -ww.